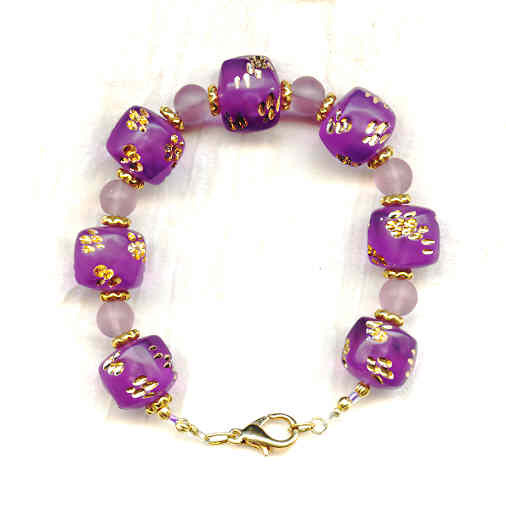 The acrylic nuggets in this funky chunky hand beaded bracelet are a gorgeous shade of deep violet, with gold-washed indents. I've spaced them with 8mm matte lilac glass beads and gold clad roundels. The gold tones add a sparkly counterpoint to the beads' soft glow. The overall length is about 8 inches (made smaller at a buyer's request, of course). The clasp is a gold clad rounded lobster claw. So very feminine, so very pretty; must be from SPARKLE PLENTY. Beaded Necklace Vintage Swarovski Crystals Ruby and Cardinal PurpleThe Swarovski ruby beads are the tapered round shape that is no longer made. The vintage acrylic beads in these earrings were moulded in West Germany sometime in the 1950s.